Explore the path less traveled with this tour-ready phaser. Made popular in the late-1960s and early 1970s, phasers create a sense of motion and add dimension to your sound. 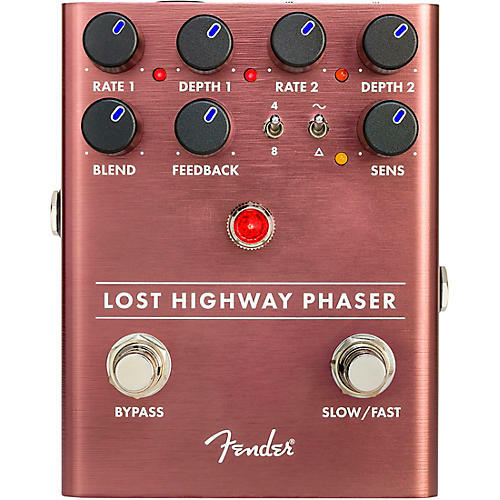 The Fender Lost Highway Phaser brings powerful, flexible analog phasing to your rig. Foot-switchable Fast and Slow speeds—each with their own independent Rate and Depth controls—let you easily alternate between slow, moody phase shifting all the way to rapid and warped modulation. The Wave toggle switch selects between Sine and Triangle waveforms while switchable 4- and 8-stage phasing makes it easy to add extra resonance on the fly. The Sensitivity control allows modulation rate changes based on your playing dynamics—dig in and the intensity of the phasing increases. Designed by Fender's in-house team of experts, the Lost Highway Phaser is an all-original Fender circuit. To ensure this pedal is performance ready Fender let musicians kick it around, took their feedback to heart and refined it. The chassis is crafted from lightweight, durable anodized aluminum, and the Amp Jewel LED gives your pedalboard the classic Fender look. The LED backlit knobs show your control settings on a dark stage at a glance.